Although hazards may happen in any workplace and it’s impossible for an employer to avoid them completely, an organisation can take preventive measures for reducing the risks of injuries and for protecting its employees in the best way possible. This includes creating a barrier between the employee and the working environment via personal protection equipment (PPE). The arms and hands are the body parts most affected by workplace injuries, representing 41% of all non-fatal work accidents. The industries in which hand and arm injuries occur the most often are manufacturing, wholesale and retail trade, constructions, human health and social work activities, administrative and support service activities, food service activities and accommodation, transportation and storage and agriculture, forestry and fishing. The purpose of the current guide is to raise awareness of the most common types of hand and arm injuries happening in the workplace, and to support organisations in building a safer environment for employees by educating them with regards to workplace injuries and providing employees with the proper hand and arm protection equipment. At the same time, this guide aims to support organisations in choosing the best personal protection equipment for their industry or application. In the workplace, employees' hands can be exposed to chemicals, irritants, electricity, moving pieces and parts of large machines that can cause injuries. Although it is the responsibility of employees to be careful and to wear appropriate protection equipment when handling substances or machines that can injure them, it is also the responsibility of the employer to provide the employees with the right personal protection equipment, and to create a safe work environment. This means that employers have to be aware of the various types of hand and arm injuries that can occur in their organisation, and of the types of hand and arm safety equipment that are most suitable for protecting against these injuries. So let's take a look at the different types of accidents that can affect the arms and hands of employees. This report shows that the most common types of injuries affecting the upper extremities are wounds and superficial injuries of the fingers, wrists and hands, bone fractures in the fingers and wrists, dislocations, sprains and strains in the shoulders or wrists, traumatic amputations of fingers, concussions of fingers, burns and scalds of the hands, infections of the hands. These hand and arm injuries are affecting not only the workers but also the employers, the economical burden of upper extremity accidents happening in the workplace being hard to neglect. Overall, work-related accidents and injuries cost the EU €476 billion a year. According to a white paper published in 2014 by DSM Dyneema, in the engineering world almost 70% of all hand injuries are caused by workers not wearing the correct safety gloves, and the average reported hand injury results in 6 days of sick leave. This comprehensive study showed that one third of companies reported more than 10 work-related injuries per year, and the hand was the most injured body part. 40% of the reported hand injuries were cuts or punctures. Statistical data from the European Commission shows that the most common causes of non-fatal accidents at work are the loss of control of a machine, means of transport, handling equipment or handled tool or object (26.2%), falls of persons (22.5%), body movement under or with physical stress (20%). 37.8% of non-fatal injuries at work due to a loss of control occur in the manufacturing industry, which is also the industry with the highest percentage of hand and arm injuries. Cuts and punctures, sprains, strains, fractures, chemical and thermal burns are the most common types of hand injuries occurring in the workplace, and the top reason for these accidents is the lack of personal protective equipment, followed by the lack of training. All these numbers and statistics show just how exposed workers are to occupational accidents and injuries, and how important it is for employers to provide their employees with the proper personal protection equipment for preventing or minimizing the rates and consequences of workplace injuries. For the hands and arms, the most effective piece of PPE is the safety glove, which not only keeps the skin clean and protects it against contamination, but also provides protection against chemical burns, cuts and lacerations, punctures, heat and cold. In the following chapters, we'll take a look at the basic safety rules that employees should follow for minimizing the risk of occupational hand and arm injuries, and we'll analyse the characteristics and design particularities of the different PPE available for the arms and hands. First, keep track of all occupational injuries occurring in your organisation and try to find injury trends and patterns. By detecting the patterns, you can identify the areas that require more focus and you can work towards eliminating the most common causes of arm and hand injuries. Look at the types of accidents happening more often, at the places where they occur and at the machines or tools involved, at the occupation of the affected workers and at the personal protection equipment they are or aren't using when performing their daily tasks. Check if your employees are provided with proper PPE and training for using the tools they work with on a daily basis, and for avoiding occupational accidents. 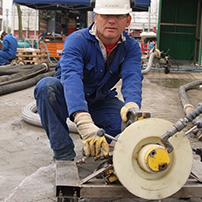 Conduct a hazard assessment of your facility and identify the potential sources of hand and arm injuries. 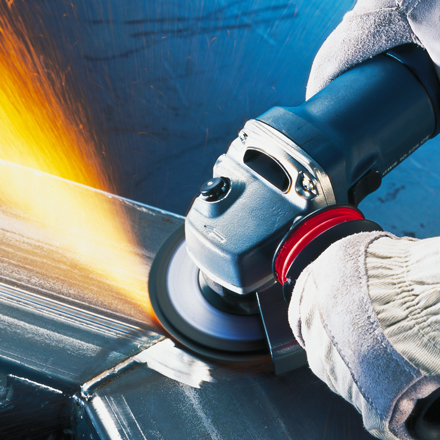 If your employees work with chemical substances, with cold or hot tools, with sharp edge materials, all these could lead to accidents so you need to know the risks your employees are exposed to daily. Once you have a better understanding of what's happening in your organisation and of the most common causes of injury, as well as of the existing risks, it's time to identify the proper protection equipment for your workers and to develop a training program with safe work best practices. For hands and arms specifically, the best PPE is the one that's matched with the existing or potential hazards. For example, if you notice that for a particular job function the rate of hand cuts is very high, you will need to supply your workers with cut-resistant protection gloves. If the rate of chemical burns is very high, then you need gloves that can protect your employees against this type of hazard and so on. 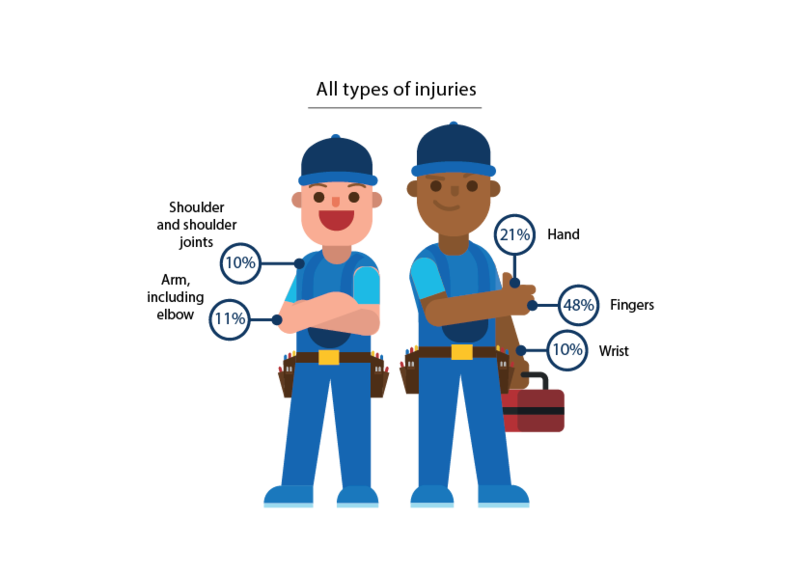 Besides investing in protective equipment, you also need to perform regular inspections of the tools and machines that your employees work with, and to make sure all the damaged parts are replaced or repaired. Look at the way chemicals are handled, at how hazardous the substances are, and at potential alternatives. If the equipment used in your organisation is not ergonomic, search for better options, to create a safer and healthier environment for your employees. Make sure that the machines have proper guarding, and that there aren't any rotating or moving parts in which your workers' hands can get trapped. Educate your workers not to interfere with moving or operating machinery, especially if they handle heavy machinery and tools. Also, do not provide them with loose-fitting clothing, if they work around machinery. Educate your employees with regards to the most common types of hand injuries happening in the organisation, their causes and the safety measures that will be taken for preventing or reducing these accidents. Teach them also the safe work practices for minimizing the exposure to these risk, and provide a comprehensive training session for the different types of gloves that fit every position or application. Finally, make sure everyone in your organisation keeps their work area clean and clear of hazards, and that they aren't wearing jewelry that can get stuck in the machines. If your employees work with chemical substances, make sure they are provided with proper hand cleansing and hygiene products. Avoiding pinch points, sharp edges and potentially hazardous spots, such as old and damaged machines, machinery with moving parts. Inspecting the tools and machines before using them, to make sure they are in good condition for safe use. Not using machines that they aren't familiar with or trained for. Being mindful of equipment that may start automatically and avoiding the operation of moving and working machines. Avoiding machines and lines of equipment that are hot or contaminated with chemical substances. Wearing the PPE recommended for their position and task. Although gloves are the most common piece of personal protection equipment, they're not the only items workers can use for protecting their arms and hands from hazards in the workplace. Gauntlets, mitts, armlets, cuffs and elbow protectors, as well as protective clothing are all suitable for minimizing the risks of occupational hand and arm injuries. As mentioned previously, some of the most frequent types of hazard that may harm the upper extremities include cuts and punctures, abrasion, temperature extremes, toxic and aggressive chemical substances, infectious agents, contamination with various compounds, electric shocks and vibration. Which of the PPE listed above can protect against each of these hazards? 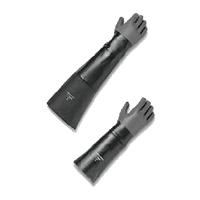 Gauntlets are protective gloves used in certain industries like constructions, plumbing, cutting, working with metals, auto repair and equipment repair, stamping. They are usually made of metal, rubber, leather or a combination of these materials, and provide protection against cuts, hits, punches, abrasion and temperature. Throughout history, gauntlets have been used by soldiers for protecting their hands and wrists in combat. Medieval gauntlets were made of steel nets, while gauntlets used by electricians are made of rubber or PVC. Those used for metal handling or welding are made of leather, while those used by military are made of white leather and used only for parades. How are gauntlets and gloves different? The term "gauntlet" can be used for referring to different types of gloves, but it is generally used to describe gloves with an extended cuff, which cover a part of the forearm. They are therefore longer than gloves, and nowadays they are used mostly in industry, for protecting workers against sparks when welding or grinding metal. Mittens are gloves without individual finger openings, that have a high thermal efficiency. They are often used for protecting the skin during winter sports or in the kitchen, when working with hot kitchenware. In hospitals, mittens that look like boxing gloves are used for covering the hands of patients in order to prevent them from pulling out the tubes used for giving them medication. Depending on their application, mittens may or may not have a separate thumb, but they generally cover the entire hand and sometimes also the wrist. Some mittens have a flap that allows one to uncover their fingers during tasks that require a better grip or higher precision. 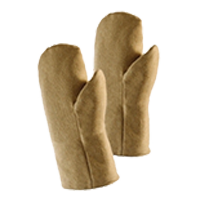 Mittens can be used as PPE when working in environments with extreme temperature, or when handling cold or hot tools. Safety cuffs are personal protection items that can be attached by a seam at the wrist for extending the hand and arm protection. They are generally made of more rigid materials that remain firm even when exposed to perspiration, and slide on and off easily. Safety cuffs can be incorporated directly in the design of protective gloves. Very similar to cuffs are safety sleeves, which can be used for protection against cuts or extreme temperature. As their name implies, safety sleeves are longer than cuffs and can be incorporated into the design of the gloves, or can be separated items that are worn on top of clothes and other protective gloves. Elbow protectors on the other hand are used for protection against abrasion and bruising in case of impact, and tend to be made of rigid materials. They can cover only the elbow area or the elbow and a part of the arm. Protective gloves garments used for protecting the hands and wrists from hazards in the workplace. They are suitable for virtually all industries and applications, but their functionality is influenced by the design, construction and materials they are made of. Gloves offer protection against punctures and cuts, chemicals, heat and cold, electricity, contaminants. The use of these pieces of protective equipment will not completely eliminate hazards or eliminate accidents, but will definitely help in building a safer work environment for employees. Statistics show that not wearing safety gloves is the main cause of hand injuries in the workplace, therefore protection gloves should be treated with maximum seriousness and should be provided by all employers to their workers. Please note that it is important for workers to always follow the manufacturer instructions when wearing PPE, and also to clean, decontaminate and maintain the protection equipment as recommended. Before wearing any item, workers should check the materials used in that product, as some materials - such as latex for example - can cause allergic reactions. Then, workers should only wear PPE that fits properly; items that are too loose can get stuck in machinery, leading to work accidents. Employees should not wear personal protection equipment that looks damaged, worn or torn, and should inspect the PPE before the first use, even if they're completely new. There can always be manufacturing problems, so it's better to take all the preventive measures for avoiding workplace injuries. Also, employees should make sure to protect all the exposed skin areas when working with chemicals, tools and machinery. This means the gloves should be long enough to cover the skin, and there should be no gap between PPE and the remaining clothing items. In case the gloves are short, additional protective equipment may be recommended. Our THORMASAFE Diamond Cut Glove series with patented Dyneema® Diamond Technology addresses the limitations of current steel and glass fiber cut resistant protection with a more comfortable, durable and safer design that delivers long term cost savings. The assortment offers gloves with the highest rated abrasion and tear resistance according to the EN388: 2016 for unparalleled protection. The standards that govern the safety glove industry are explained below. This standard defines the general requirements for glove design and construction, innocuousness, comfort and efficiency, marking and information applicable to all protective gloves. This standard can also apply to arm guards. A glove is an item of personal protective equipment which protects the hand or any part of the hand against hazards. It may also cover part of the forearm and the arm. These are gloves for minimum risk applications only, as they offer protection against limited risks. An example is household gloves, gardening and cleaning gloves, cotton and leather gloves and gloves used for protection against warm objects or temperatures that don't exceed 50⁰C. These products can be tested and certified by manufacturers themselves. 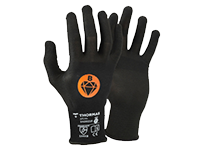 These are destined for intermediate risk applications and must be tested and certified by an approved inspection organisation, who will issue a CE marking reflecting the glove's protective capacity. Products in this category cannot be sold without the CE marking. Such gloves are those used for general manipulative techniques, which have good cut, perforation and abrasive resistance. The gloves in this category should protect against irreversible or fatal risks. They must be tested and certified by an approved inspection organisation, who should also inspect separately the system for quality and control that the manufacturer uses to guarantee the uniformity of the production. The number that identifies this organisation has to be added next to the CE marking on the glove. NOTE: The current PPE Directive 89/686/EEC will be replaced on April 21st with the new PPE Regulation (EU) 2016/425. The grouping of the PPE categories remains the same as in the current Directive, however some products move from Category 2 to Category 3. Products that move to Category 3 include those protecting against biological risks, bullet wounds and knife stabs, cuts by hand-held chain saws, high pressure jet cutting, risk of drowning and harmful noise. Gloves should offer the greatest possible degree of protection in the foreseeable conditions of end use. When seams are included, the strength of the seams shouldn't reduce the overall performance of the glove. The gloves themselves shouldn't cause any harm to the user. Their pH should be between 3.5 and 9.5, and the chromium content should be below detection (<3 ppm). Natural rubber gloves should be tested on extractable proteins as per EN 455-3. Antistatic gloves that are designed to reduce the risk of electrostatic discharges should be tested as per EN 1149. Obtained test values are to be reported on the instructions for use. An electrostatic pictogram shouldn't be use. Gloves that are below the minimum length should be called "Fit for Special Purpose". If required, performance should be graded as per table below. *Pin that can be picked up with gloved hands 3 times/30 seconds (mm). If required, gloves should allow water vapour transmission (5 mg/cm2). If gloves exclude water vapour transmission, it should be at least 8 mg/cm2 for 8 hours. Each glove should be marked with the name of the manufacturer, glove and size designation, CE mark and appropriate pictograms accompanied by relevant performance levels and the reference of the EN standard. The marking should be legible throughout the life of the glove. If the marking is not visible because of the characteristics of the glove, it should be mentioned on the first packaging enclosure. The packaging that contains the glove should have the following marking: name and address of the manufacturer or representative, glove size and designation, CE mark, usage info - simple, intermediate or complex design, with relevant pictograms. If protection is limited to one part of the hand, this should be mentioned. Also, the packaging should have a reference to where more information can be obtained. This standard is for gloves worn by workers who require protection from chemicals and/or micro-organisms that could irritate the skin. The standard specifies the capability of the glove to protect the user against these irritants. Penetration - The movement of a chemical and/or other micro-organism through porous materials, seams, pinholes or other imperfections in a protective glove material at a non-molecular level. Degradation - Sometimes chemical protective gloves can act as sponges, soaking up the liquids and holding them against the skin. This degrades the glove. Degradation is the deleterious change in one or more properties of a protective glove material due to contact with a chemical. Indications of degradation are flaking, swelling, disintegration, embrittlement, colour change, dimensional change, change in appearance, hardening, softening and so on. Permeation - The rubber and plastic films in gloves are the barriers to chemicals. It is therefore necessary to measure breakthrough times, or the time taken for the hazardous liquid to come in contact with the skin. Each chemical tested is classified in terms of breakthrough time performance level 0 to 6. Penetration - A glove shouldn't leak when tested with an air and water leak test, and should be tested and inspected in compliance with the acceptable quality level. Permeation - A glove should pass the minimum requirements of Type C, at least Level 1 (more than 10 minutes) against one chemical on the list of chemicals defined in part 1. 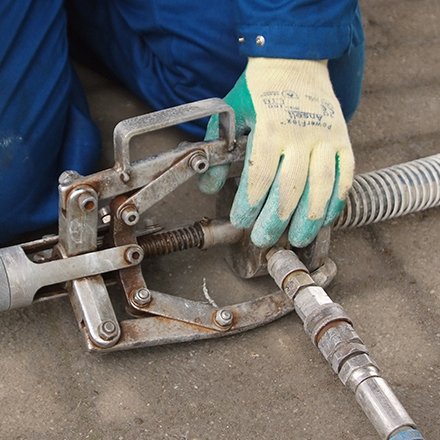 Degradation - The change of puncture resistance after chemical contact should be tested for all claimed chemicals on the glove and the result mentioned in the instructions for use. 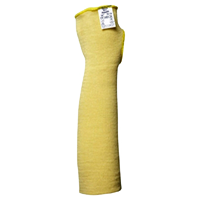 Long gloves - If the length of the chemical protective glove is ≥ 40 cm, the cuff area must also be tested for permeation. 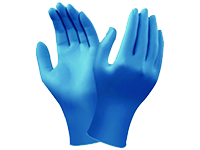 Penetration - These gloves have the same requirements as chemical gloves, if protection against bacteria and fungi is claimed. 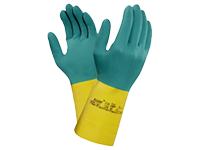 Virus protection - These gloves have an additional test as per ISO 16604, if virus protection is claimed. Long gloves - If the length of the chemical protective glove is ≥ 40 cm, the cuff area must also be tested for virus penetration. WARNING: The chemical data information doesn't necessarily reflect the actual duration in the workspace. The chemical resistant glove pictogram must be accompanied by digit code letters for Type A and Type B gloves. Type C marked gloves are without any digit code letter. These code letters refer to a list of chemicals defined by the standard. The minimum breakthrough time for a Type C glove is 10 minutes for one chemical, for a Type B glove it is 30 minutes for at least 3 chemicals, and for Type A it is 30 minutes for at least 6 chemicals on the list. The marking should include the CE mark and ID of notified body, care and storage instructions, instructions and limitations of use, degradation results on claimed chemicals, a list of substances used in the glove which are known to cause allergies, name and address of body that certified the product. A list of all substances in the glove should be made available upon request. Marking as per EN ISO 374-5: For gloves protective against bacteria and fungi, the biohazard pictogram is applied. For this the protective glove must be tested according to EN374-2:2013 for leakage proofness. For protection against bacteria, fungi and virus, the biohazard pictogram is accompanied with the term "VIRUS" underneath. For this protective standard, the glove must be tested according to EN374-2:2013 for bacteria and fungi and tested according to ISO16604: 2014 (Method B) using the bacteriophage penetration test. NOTE: With this standard, protective gloves against micro-organisms can be claimed with or without chemical protection and vice versa. A new version of this standard was published in 2016, and replaced the 2003 standard. The new one doesn't apply retrospectively, therefore gloves may be sold under both versions of the standard until 2023. After that, under the new regulations, certifications will have to be renewed, and gloves will have to meet the new standard. Abrasion testing - New abrasive test paper will be used in order to provide more consistency of test results. It is possible for some abrasion scores to change when recertification is done. Cut resistance - The current Coup Test method will be supplemented by the new ISO 13997 test method if a product reaches 60 cycles or if blunting of the blade occurs before 60 cycles. The ISO test is measured in Newtons and will be depicted by a letter added to the end. Additional marking will be required for items tested under the ISO test method. For example, a glove tested using the Coup Test method with a score of 4.4.3.2 will also be tested using the ISO test method and a score will be added - e.g. 4.4.3.2.B. Some manufacturers may choose to use the ISO test only. In this case, the score will be shown as 4.X.3.2.B. Impact protection (if relevant) - Where impact protection is claimed, there has been the introduction of EN 13549 Gloves which pass this test will be assigned the letter "P". E.g. 4.X.3.2.B.P. A: Resistance to abrasion - Based on the number of cycles required to abrade through the sample glove. B: Blade cut resistance - Based on the number of cycles required to cut through the sample at a constant speed. The Coup testis the current method of testing cut resistance. C: Tear resistance - Based on the amount of force required to tear the sample. Cut resistance - The Coup test has now been revised limiting the maximum cycles to 60 whether or not the blade has cut through the test material. Under the new regulations, gloves achieving cut level 4 or 5 using the Coup test will be subject to the new ISO 13997 test, which measures the cut resistance in Newtons. Impact protection - EN 388: 2003 standard does not include an impact resistance test. The 2016 revision contains an additional test where a specific claim of impact resistance is made. Testing is carried out in accordance with EN 13594: 2015. To test the glove, the area of protection is secured over a domed anvil and is impacted at an impact energy of 5J. Where the requirements of the test are fulfilled by the gloves, the marking code "P" will be displayed on the glove marking, after all other protective characteristics. This standard applies to any glove that protects the hands against convective and contact cold down to -50°C. All gloves must achieve at least performance level 1 for abrasion and tear. Protection against cold is expressed by a pictorgram followed by a series of 3 performance levels, relating to specific protective qualities. The cold hazard pictogram is accompanied by a 3-digit number. A - resistance to convective cold: performance level 0-4. Based on the thermal insulation properties of the glove which are obtained by measuring the transfer of cold via convection. B- resistance to contact cold: performance level 0-4. 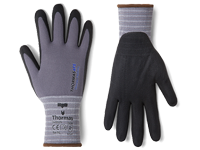 Based on the thermal resistance of the glove material when exposed to contact with a cold object. C - Penetration by water: performance level 0 or 1. 0 = water penetration, 1 = no water penetration. This standard specifies thermal performance for protective gloves against heat and/or fire. All gloves must achieve at least performance level 1 for abrasion and tear. A. Resistance to flammability - performance level 0-4. Based on the length of time the material continues to burn and glow after the source of ignition is removed. The seams of the glove should not come apart after an ignition time of 15 seconds. B. Contact heat resistance - performance level 0-4. Based on the temperature range (100-500°C) at which the user will feel no pain for at least 15 seconds. If an EN level 3 or higher is obtained, the product should record at least EN level 3 in the flammability test. Otherwise, the maximum contact heat level should be reported as level 2. C. Convective heat resitance - performance level 0-4. Based on the length of time the glove is able to delay the transfer of heat from a flame. A level of performance should only be mentioned if a performance level 3 or 4 is obtained in the flammability test. D. Radiant heat resistance - performance level 0-4. Based on the length of time the glove is able to delay the transfer of heat when exposed to a radiant heat source. A performance level should only be mentioned if a performance level 3 or 4 is obtained in the flammability test. E. Resistance to small splashes of molten metal - performance level 0-4. 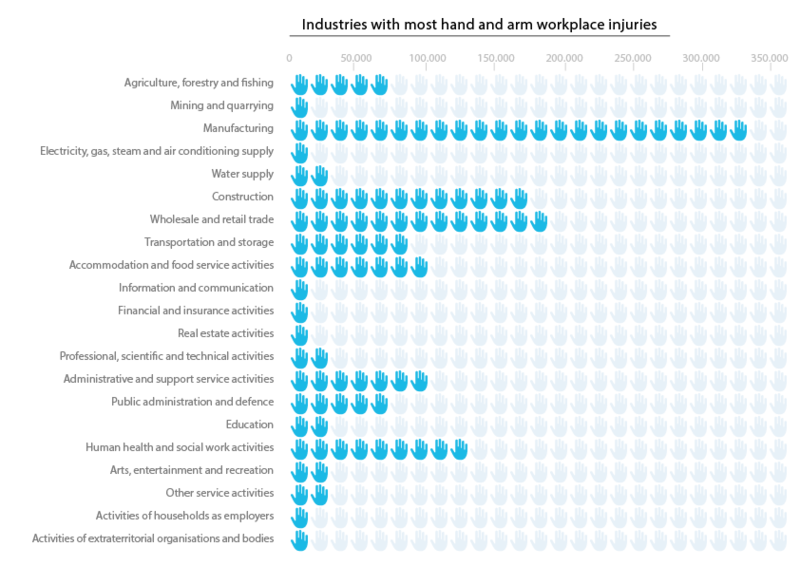 The number of molten metal drops required to heat the glove sample to a given level. A performance level should only be mentioned if a performance level 3 or 4 is obtained in the flammability test. F. Resistance to large quantities of molten metal - performance level 0-4. The weight of molten metal required to cause smoothing or pinholing across a simulated skin placed directly behind the glove sample. The test is failed if metal droplets remain stuck to the glove material or if the specimen ignites. This standard applies to gloves that offer protection against ionizing radiation and radioactive contamination. The nature of the protection is clarified by a pictogram that refers to the specific protective characteristics. To protect against radioactive contamination, the glove must be impermeable and must pass the penetration test defined in EN 374. To protect against ionizing radiation, the glove must contain a certain amount of lead, referred to as lead equivalence. The lead equivalence must be marked on each glove. Materials that are exposed to ionizing radiation may be deformed by their reaction to ozone cracking. That test is optional and may be used as a tool to select gloves that must be resistant to ionizing radiation. This standard contains all requirements for efficient protection against electrical currents and does not refer to other glove standards, such as EN 388 or EN 374. For gloves made from insulating material inspections at regular times are recommended. The gloves must be inspected when the previous inspection was carried out more than 6 months ago. The gloves must be packaged individually. The packaging must be strong enough to protect the glove against damage and sunlight. Class 00 - Max use volts AC 500 V.
Class 0 - Max use volts AC 1.000 V.
Class 1 - Max use volts AC 7.500 V.
Class 2 - Max use volts AC 17.000 V.
Class 3 - Max use volts AC 26.500 V.
Class 4 - Max use volts AC 36.000 V.
This standard refers to gloves designed for welding operations and defines the minimum performance requirements and test methods appropriate for protective gloves used in metal welding, cutting and allied processes. It includes requirements from the EN 420, EN 388 and EN 407 standards, to ensure that the gloves are correctly sized and comfortable, so as to not cause harm to the wearer. Welding gloves should provide protection against small splashes of molten metal, short exposure to convective heat, radiant heat and contact heat, as well as mechanical risks. Type A - lower dexterity gloves with higher performance for physical characteristics like abrasion, convective heat resistance, puncture and tear, recommended for all welding processes except for TIG welding. These offer better protection against heat. 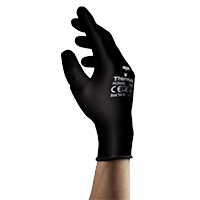 Type B - higher dexterity gloves with lower physical performance, recommended for TIG welding. These gloves offer a lower protection against heat but are more flexible and pliable. When selecting protection gloves for your employees, the most important aspect is the application that glove will be used for. There are multiple types of gloves on the market, but as you can see in the different standards, each application requires a specific type and level of hand protection, therefore the nature of the job and the potential hazards should dictate the type of glove chosen. We already saw the standards that apply for these types of gloves, so in this chapter we'll discuss about their construction, commonly used materials, coatings and design particularities. Safety gloves can come in different designs and construction styles. The most common structures are unsupported polymer gloves, knitted gloves, coated gloves and sewn gloves. Unsupported gloves are excellent for offering protection against chemical and biological hazards, but they're not suitable for mechanical hazards, as they offer little to no resistance against cuts or other such accidents. These gloves are very flexible and provide good dexterity and tactile sensitivity, and are usually made of rubber materials. If more polymers are combined in the material, then it is possible to increase the mechanical and chemical performance of these gloves. In the same way, if plasticizers, stabilizers or solid filler reinforcements are added, the resistance of these gloves and the protection offered can be increased. Knitted gloves provide little to no resistance to punctures, chemicals and biological hazard, but they offer good flexibility and breathability, and depending on the fibre they can also protect against sharp edges. The seamless design of these gloves makes them less irritant for the skin, as there's less friction, so these gloves are often used as liner in multi-layered protection gloves. For example, if a knitted layer is used underneath a polymer layer, then the glove is less irritant, warmer, protects better against chemical and biological hazards, and also offers some level of cut protection. Unlike polymer materials, yarn is less likely to cause allergic reactions. Knitted liners can be used in combination not only with polymers but also with coated gloves. The coating on a glove is obtained during the dipping process, by soaking a textile layer in a polymer suspension. The polymer penetrates the textile material, therefore changing its resistance to chemicals and biological hazards and depending on the number and types of polymer layers added, it can lead to gloves that are resistant to cuts and punctures also. By adding coatings to knitted gloves, the flexibility can be preserved, while other properties such as the resistance to cuts can be improved. Depending on the application of the safety gloves, they can also be only partially coated, and in this case they offer more breathability. Partially-coated gloves usually leave the back of the hand as it is and coat only the palm and fingers. If a more complex glove design is desired, then sewing is the best option. Sewn gloves can combine materials that are otherwise incompatible, and lead to more versatile designs. Sewn gloves can be coated with polymers to increase their resistance to fluids, chemicals and biological hazards. Still, they have one major disadvantage, and that is the presence of seams, which not only may cause irritation due to friction, but may also lead to a decreased flexibility. The materials used in the construction of protection gloves may vary, but are generally fibres and textiles or polymers. Usually these materials are synthetic, but in some cases natural materials such as leather may also be used. The selection of a glove should be based on the existing hazard, but also on the materials included in its construction, as these materials give the actual resistance and protection level of the glove. As shown in the EN 374 standard, chemical-resistant gloves have to withstand three main types of damage: permeation, penetration and degradation. The quality, thickness and permeability of the materials these gloves are made of will dictate their level of protection against specific chemicals. However, because each material resists or reacts differently to different chemicals, there is no universal glove able to protect against all chemicals. In the previous chapter, we've seen the most common chemicals used in industry applications, so now let's take a look at some materials that can be found in the construction of safety gloves, and at the level of protection they offer. Natural rubbers like latex offer good protection against solvents, ketones and acids, but are not good for protecting against oils, greases, organic solvents or hydrocarbons. Moreover, latex is likely to cause allergic reactions. Nitrile is a synthetic rubber with good abrasion resistance, often used in general-duty gloves. It is excellent for protecting against most chemical substances except for ketones, so if your workers have to handle such substances, it's better to opt for a different material, such as butyl for example. This material is especially efficient against ketones and esters, as it has a high permeation resistance to gas and water vapors. However, butyl doesn't offer good protection for the other chemicals mentioned above. Nitrile is a good alternative for people with latex allergies. PVC, also a common material used in chemical-resistant safety gloves, is a synthetic thermoplastic polymer with good abrasion resistance, very efficient against acids, oils and greases. It is, however, very poor in creating a barrier against organic solvents. PVA offers protection against ketones, oils and greases, and is highly impermeable to gases. Still, it is not the best option for water-based substances, as it is water-soluble. Neoprene is one of the most versatile options for chemical-resistant safety gloves, as it protects against most substances except for solvents. It can be used to create a chemical barrier against acids, bases, alcohols, fuels, phenols, peroxides and hydrocarbons, and is good for most hazardous chemicals. Neoprene has good tensile strength and heat resistance, but moderate abrasion resistance. NOTE: Please note that combining two or more substances can change their chemical properties and their effects on the mentioned materials, therefore if you select safety gloves for handling mixtures, you need to pay attention at the new permeation rates. In general, for mixtures, the glove should be selected based on the chemical component with the shortest breakthrough time. Keep your workers' hands safe! Explore our full assortment of chemical-resistant gloves that comply with the EN 374 standard, from top brands like Ansell, Polyco, John Ward or RX. Disposable gloves not only offer protection for the skin, but they also prevent the contamination in industries like food, pharmaceutical, chemical and so on. These gloves are generally made of thin materials that offer good dexterity, sensitivity and movement, being suitable for precision tasks. They have, however, poor resistance to chemical stress when compared to chemical-resistant gloves for example. Disposable gloves are also referred to as hygiene gloves as their role is exactly this: to keep the hands clean and create a barrier between the skin and the handled substances or products. Depending on the material they are made of, disposable gloves can offer some degree of protection against chemicals, but they should never be worn as the only protection against harsh or hazardous chemical substances. The most common materials used in disposable gloves are latex, nitrile, neoprene and vinyl. Latex is a natural rubber product that offers great comfort and performance and is suitable for handling inorganic chemicals. It has great elasticity and adaptability, offers great dexterity and comfort, and prevents fatigue, being a very thin material. Latex gloves are ideal for precision tasks and have good performance with the most common chemicals used in laboratory work, as well as with solvents. However, they are not that efficient against petroleum-derived compounds, aromatic solvents, oils, fats, milk and dairy products, or minerals and vegetables. Latex offers good protection against infections, but can trigger allergic reactions, so it may not be the best choice for everyone. For people who are allergic to the natural rubber latex, synthetic alternatives can be used. Nitrile gloves have a similar feel to latex, but they don’t cause allergies or irritation, therefore they are a good solution for people with allergies to natural latex. Nitrile offers efficient protection against harsh chemicals and solvents, mineral and vegetable oils, gasoline and diesel fuel, grease and many acids. The material has great elasticity and adaptability, it’s resistant to friction and wearing, and it is comfortable and easy to put on. The inner surface of the gloves made from nitrile is often treated to reduce the risk of contact dermatitis, therefore these gloves are better for people with excessive sweating and little tolerance to dust. Gloves made of nitrile are suitable for the chemical and food industry, health and laboratory work. They are more resistant to punctures than latex gloves, and more elastic than vinyl gloves, so they’re often preferred in the medical world. Thanks to their formula, these gloves are warmed up by body heat therefore they conform to the hands and offer great sensitivity and dexterity. 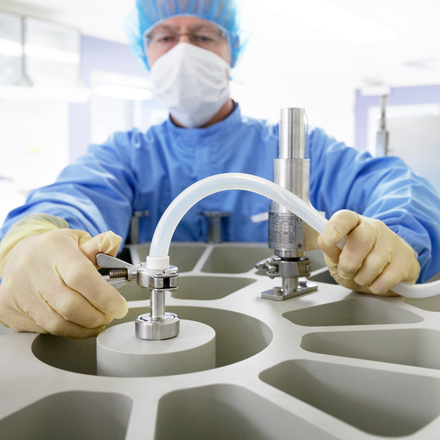 Vinyl gloves are less elastic than latex and nitrile ones, but are more cost-effective, so they are preferred for tasks that don’t take too much time and don’t require that much comfort. They aren’t very resistant to punctures or chemical stress, so they’re not a good option for handling dangerous substances, but they can be safely used for handling food items and for protecting the skin against soiling or low-hazard chemicals. Gloves made of this material are completely latex-free, therefore they don’t trigger allergic reactions, and they have good performance with some organic acids, solvents and alcohols. Still, they are porous, so they don’t offer enough protection against petroleum products or oils. Vinyl gloves shouldn’t be used in the chemical industry or for laboratory tasks. Neoprene offers good protection against acids, oils, grease and volatile chemicals, so they’re suitable for handling alcohols, fuels and hydrocarbons. Gloves made of neoprene are often used in the medical industry and for handling high-risk substances. They are latex-free, therefore less likely to cause skin irritation and allergic reactions, and they keep their flexibility over a wide temperature range. In the food industry but also in gas stations, often polyethylene gloves (PE) are chosen, as they are very cost-effective and simple. They have no added plasticizers or additives, are quite rigid and transparent, and have a low thickness, so they don’t offer protection against harsh chemicals, but they are suitable for short, simple tasks such as handling food in a supermarket. Explore our full assortment of disposable safety gloves that comply with the EN 374 standard, from top brands like Ansell, Bodyguards or Shield. Thermally insulating gloves include both heat-resistant and cold-resistant gloves, but we’ll discuss these two types separately, as they have different characteristics and are regulated by different standards. Heat-resistant gloves are essential when workers are exposed to heat hazards. As shown in the EN 407 standard, these gloves have to pass several tests, such as the resistance to flammability, to contact and convective heat, resistance to radiant heat, to small or large splashes of molten metal. To test the resistance to flammability, the glove is stretched and placed above a flame for 15 seconds. To test the protection against contact heat, the material is exposed to temperatures between 100°C and 500°C. For the resistance to convective heat, the glove material is exposed to the heat from a gas flame. The fourth rating measured for heat-resistant gloves - the resistant to radiant heat - is tested by measuring how long the glove can delay the heat transfer from a radiant source. Heat-resistant gloves can be made of different materials and can have various constructions, but the common options are terry knit and synthetic materials. Natural materials like terry cloth work the best in temperatures below 230°C, as they trap the air inside and create an excellent insulating layer. They also have good dexterity, but they're not suitable for extreme temperatures. Wool offers comfort and basic heat resistance, and is often used as liner, but isn't the best for extreme temperatures neither. For temperatures above 230°C, synthetic materials such as Kevlar® or synthetic rubber are more suitable, as they offer better protection not only against heat but also against hot liquids and steam. Leather is also used in heat-resistant gloves as it offers protection against heat, flame and abrasion. Aluminized fabrics reflect radiant heat, protecting from molten splash. Carbon fiber doesn’t burn so it’s a good choice for heat-resistant gloves used for welding for example. PVC can offer protection for temperatures under 100°C, and it’s an economical and durable solution. In what concerns cold-resistant gloves, these have to protect the hands against frostbite, while ensuring good dexterity and comfort. A properly-selected pair of gloves will keep your workers’ hands warm and dry while allowing them to work efficiently and reducing the risks of accidents. The standard that applies to these gloves is EN 511, which measures the performance of gloves against convection and conduction, and their heat retention properties. Each of these factors are rated with levels between 0 and 4 (convection and conduction), respectively 0 and 1 (heat retention). Convection is the process of losing heat through the movement of air or water on the skin. Conduction means the loss of heat through physical contact with another object, such as a frozen ball or ice. Finally, heat retention refers to the amount of heat an object or material can store over a period of time. Now, what does this standard say in common language? Mainly that the main requirements for a good cold-resistant safety glove are to keep moisture away while capturing warmth, to be waterproof and wind repellent, and to ensure a good fit and comfortable wear. These requirements can be met with a multi-layer design, in which materials with different properties work together to provide the desired level of protection against cold, water, moisture and wind. Typically, thermally-insulating gloves consist of an outer layer that is the first line of defense against cold, and an insulation layer that comes in contact with the hands and keeps them warm. The layers are made of carefully selected materials which function complementary, offering protection not only against low temperatures but also against mechanical hazards. The outer layer is often made of leather, acrylic fibres or ripstop nylon covered with a water-repellent finish, which keeps water away and protects against wind as well. Instead of a thin finish on the outer layer, cold-resistant gloves can also feature a waterproof layer that is bond to the outer shell to increase protection and shut out moisture and cold air. The insulation is commonly made of wool, fleece or acrylic material that maintains warmth. Depending on the design, the back of the hand can have a higher-loft insulation layer, while the palm can have a thinner, lower-weight insulation layer. If the gloves are worn in temperatures lower than -5°C, this multi-layered design is almost a must for keeping the hands safe and dry and for protecting against frostbite. Polypropylene – used for the liner, it’s good for keeping water and moisture away, but doesn’t add that much warmth. Therefore, this material needs to be used in combination with warmth-locking layers when the hands are exposed to cold temperatures. Thinsulate™ - thicker and designed to keep the hands warm, this material is more efficient for protecting against cold weather, and can keep the warmth even after it becomes wet. However, its drying properties aren’t the best, so once it gets wet, it stays wet. Thermolite® - a moisture-wicking liner for cold-resistant gloves, this material dries faster than Thinsulate™ and keeps heat inside. However, it’s not efficient in temperatures lower than 5°C. Wool can be an excellent option for adding extra warmth to a cold-resistant glove and for wicking away moisture. However, this material adds extra bulk, so it’s not the best option when the work requires high precision and dexterity. Polymer-based materials like ComFortrel® are great for liners as they have moisture-wicking properties and aren’t as bulky as wool, so they’re a good choice if you’re looking for a slim liner to add underneath a work glove. Leather isn’t excellent at keeping cold-away, but it is often used as reinforcement on the palms, as it is soft and offers good grip. It is also more breathable than other materials and better at keeping moisture away. Goose down has great warmth-locking properties but it lacks breathability and is bulky, therefore isn’t the best option for gloves that require dexterity. PrimaLoft – Just like goose down, this material is good for locking the warmth and is more breathable and water-resistant, but it doesn’t offer good dexterity. PVC – in cold-resistant gloves, this material is used for coating, as it offers excellent gripping characteristics and abrasion resistance, therefore makes gloves suitable for both wet and dry conditions. Fleece keeps the hands warm even after it gets wet and offers good breathability and moisture absorption, so it’s often used for the inner layer of the glove. It is, however, quite bulky, so it’s not excellent at ensuring good dexterity or precision. NOTE: Please note that cotton is a terrible insulator for cold-resistant gloves, as it absorbs moisture and once it gets wet, it stays wet and cold. Explore our full assortment of thermally-insulating gloves that comply with the EN 407 and EN 511 standards, from top brands like Ansell, Honeywell or Format. Electrically insulating gloves need to comply with the EN 60903 standard, which defines six classes of safety gloves, from 00 to 4. Those with better ratings (higher class numbers) are approved for higher voltages, so in order to select a glove in this category for your workers, you need to know the maximum voltage they could be exposed to during work. The design and materials of these gloves may vary, but in most cases electrically insulating gloves are five-finger gloves with ergonomic shape, made of a high-quality rubber material that ensures a good flexibility. To prevent potential allergic reactions and skin irritations, workers should wear a liner under the rubber insulating glove, as this additional item will reduce the discomfort, absorb perspiration and keep the hands warm. On top of the rubber glove the worker can add a leather protection layer, which can increase the mechanical resistance of the glove, making it more efficient against punctures, abrasion and cuts. At the same time, the leather layer protects rubber against the effects of ozone, which can cause cracking and damage the glove, making it inefficient. The exceptions from this recommendation are Class 00 and Class 0 gloves used when the voltage doesn’t exceed 250V AC or 375V DC. In this case, under limited-use conditions, if the work requires unusually high finger dexterity or the handled parts and equipment are of small dimensions, then workers may use only the insulating glove, with no additional leather layer. The same applies for the other gloves (Class 1 – 4) under limited-use conditions, if the job requires unusually high dexterity and the worker can demonstrate that the risk involved in low. However, in this case, the glove rating has to be one class higher than the one actually recommended for the involved voltage. Given that electrically insulating gloves can be easily damaged by ozone and mechanical stress, it’s important to test them before each use, even if they are completely new. Both the gloves and the cuffs or sleeves should be inspected for cuts, rips, tears, holes and UV damage, as well as for signs of chemical deterioration or contamination, such as swelling of the material. Based on their behavior when exposed to ozone, insulating gloves are classified into two types: type I and II. Gloves marked Type I are not ozone-resistant, while gloves marked Type II are ozone-resistant. 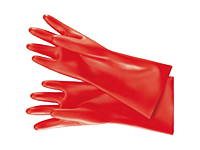 In general, natural latex gloves are less resistant to ozone than nitrile, neoprene, EPDM or vinyl gloves. Type I gloves are often made of natural rubber, while Type II gloves are made of synthetic materials. Still, keep in mind that both natural latex and synthetic materials like nitrile and neoprene will react with ozone, so even if you opt for a nitrile glove instead of a latex one, you still need to inspect before use, and to store it properly. Speaking of storage, electrically insulating gloves should be kept out of sunlight and excessive heat or humidity, away from ozone and chemical substances that could damage the materials. Electrically insulating gloves are used in a wide range of industries and applications, from telecommunications, constructions and hospitals to transportation and automotive industries, water plants, machine construction and operation, HVAC, in schools, office buildings and so on. Explore our full assortment of electrically insulating gloves that comply with the EN 60903 standard, from top brands like Knipex and Polyco. In order to select the proper cut-resistant gloves for your employees, you need to start from the potential hazard they are exposed to. Although “cuts” are regarded as a single type of hazard and cut-resistant gloves share similar characteristics, there are actually more types of cuts that can occur in the workplace, and each of them requires a different level of protection, therefore a different glove. Moreover, workers who need protection against cuts may also need a glove that provides good mobility, dexterity or protection against high or low temperatures, therefore there are more criteria to consider when choosing a cut-resistant glove. For this reason we recommend that before you buy a glove, if it’s the first time you use such PPE in your organization, you contact our specialists for an evaluation of all hazards and risks your employees’ hands are exposed to. Now let’s discuss the types of cuts that can occur in the workplace. In several industries, workers are exposed to the risk of cuts by sharp objects like knives, blades, metal sheets or glass. These can lead to nuisance or low cut hazards, moderate, high or extreme cut hazards, and each of these injuries can occur in a different manner. For example, if the cut appears after rubbing the hand against a sharp edge, it’s called abrasive cut. If it occurs when handling a sharp object like a knife or a cutter, it’s referred to as slicing cut, and if the injury is caused by a falling object or another similar force, it’s called impact cut. 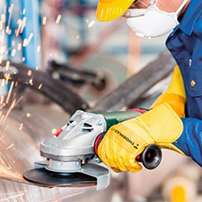 There's not a single safety glove that can offer full protection against all these types of hazards, but there are different designs and construction styles, as well as combinations of materials and coatings that can offer sufficient protection against cuts. In general, the heavier weight a glove’s material is, the greater the protection it offers, but there are also lightweight materials that can keep workers' hands safe. The cut resistance level of a material is determined by a series of factors, such as the strength, hardness, lubricity and rolling action, so a material that has such characteristics will be more cut-resistant than one with poor hardness for example. Some of the best materials used in the construction of cut-resistant gloves are Dyneema® fibres, Spectra®, Kevlar® and SuperFabric®, but also steel wires and glass fibres which are incorporated into the glove for an increased resistance. These fibres can be used in different glove constructions, but the most common design for a cut-resistant glove consists of three layers: a liner, a coating and a grip layer. The liner is the layer that comes in contact with the skin and provides structural support to the glove. It is made with advanced fibres and serves as the backbone of the glove. For rough edge sharpness and low force, a low-to-medium gauge, thick liner provides more fabric loft to absorb and resist abrasion. In case of high force exposure, a thicker liner with low gauge is more recommended. For high cut hazards, a medium gauge, thicker liner absorbs the pressing edge and allows the yarn to roll. Gloves with higher gauge liner offer more protection against shard edges therefore are better for medium to high cut hazards. The coating offers protection against abrasion, cuts, punctures, snags, tears and contamination, and enhances the grip of the glove. A thicker coating can enhance the resistance to abrasion and tearing, therefore increasing the protection in case of contact with rough edges. Finally, the grip material enhances the safety of these gloves by preventing slippage and reducing the risk of contact with sharp objects. There are a lot of different grip styles, such as smooth, crinkle, with pattern, with micro foam or micro finish, rough grips and so on. 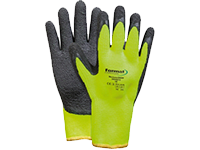 The resistance of these gloves is tested in different ways and rated as described in the EN 388 standard. For example, EN 388 level A stands for 2N or 203 grams to cut through, so gloves with this level of protection are suitable for light material handling and small parts assembly without sharp edges. Level B stands for 5N or 509 grams to cut through, and is suitable for warehouse tasks, packaging and light duty general purpose use. Level C is given to gloves that can withstand 10N (1019 grams to cut through) and is suitable for gloves used for light duty metal handling, metal stamping, HVAC, light duty glass handling, plastics and material handling. Level D stands for 15N or 1529 grams to cut, and is suitable for bottle and light glass handling, light duty metal handling, appliance manufacturing, canning, electrical industry, dry walling, HVAC and carpet installation. Level E is given to gloves that can withstand 22N or 2243 grams to cut through, which are suitable for metal stamping, sheet metal handling, glass handling and automotive assembly. Finally, EN 388 level F stands for 30N or 3059 grams and is suitable for heavy duty metal stamping, metal recycling, food processing and pulp and paper industry. Explore our full assortment of cut-resistant gloves that comply with the EN 388 standard, from top brands like Thormas or Ansell. Industrial gloves can vary greatly not only in their design but also in the used materials, as these depend on the application and hazard the hands are exposed to. Industrial gloves can be made of rubber materials such as latex, from synthetic materials, fibres, can have one or multiple layers, can have reinforcements and coatings. For example, we've already seen that in the chemical industry the most common safety gloves are made of latex, nitrile, neoprene or vinyl. 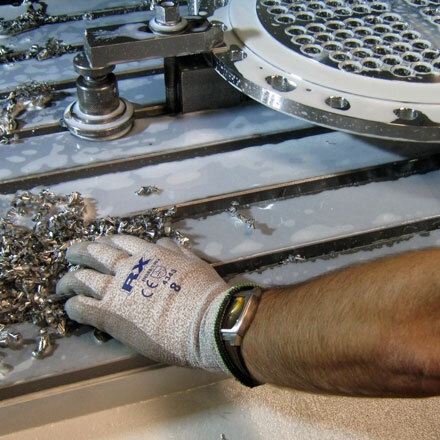 In industries where the hands are exposed to sharp tools and edges, cut-resistant gloves are needed, and these are usually made of stronger materials, often with multiple layers, with or without metal mesh. In the food industry, disposable gloves are the most common, as they're cost effective, offer enough protection for the skin and prevent the contamination of the handled products. In the transport industry, gloves are usually made of leather material which provides good grip and control of the steering wheel, with or without reinforcements or padding in the palm area for more comfort. Gloves for electricians offer electrical insulation properties, while those for welders offer protection against heat and splashes of molten metal. There are also gloves suitable for general industry applications, or general-purpose industrial gloves. These are suitable for factory and warehouse work, bricklaying, gardening, construction and so on. They often have insulation layers and coatings for a better grip. These gloves are ideal when you don't require protection against special hazards like high or low temperatures, hazardous chemicals, electrical current or cuts. Explore our full assortment of industrial gloves that comply with the EN 388 standard, from top brands like Thormas or Ansell. Mechanical hazards, such as heavy or sharp objects, power tools, wires and ropes, broken glass or needles, nail guns and so on. The type of contact is also important, as incidental contact doesn't have the same consequences and risks as intentional contact. Incidental contact occurs when the direct contact with the hazard is not intended, for example when a worker handles a toxic chemical substance and splashes it over his hands. In this case, some types of gloves may offer enough protection, if the glove is removed fast enough and the skin cleaned thoroughly. Intentional contact occurs when contact with the hazard is expected and inevitable. For example, when a worker performs a task that involves immersing his hands in a chemical substance, the contact with that substance cannot be avoided. In this case, the safety glove has to offer a higher degree of protection than in the previous case. For the correct glove length, you need to know the depth of immersion in a solution or the level of protection required. The glove length is measured from the bottom edge of the palm to the tip of the middle finger. Gloves appear to have their origin in ancient Greece, both Homer and Herodotus mentioning these accessories in their writings. The fresco pictured on the left, originating in Akrotiri, Greece, is one of the earliest documented use of gloves. Throughout the Middle Ages, gloves made of leather or metal (gauntlets) were part of the protection armour of soldiers, but the need of wearing such protective equipment disappeared with the advent of firearms, which made hand-to-hand combat rare.